Kicking off a second decade with more of the same. Seems about right. With their sixth studio album, San Diego’s As I Lay Dying elbows into their second decade with another chugging, pit-ready selection of metalcore. Awakened is less a step forward than more of the same, a tweak of the band’s attack more than an evolutionary course. "There's nothing totally out of left-field, we just refined our songwriting and incorporated some ideas that bring a real freshness to the record," guitarist Phil Sgrosso says. "We wanted something that was a lot bigger and more open sounding, and that's exactly what we achieved." Featuring Sgrosso, vocalist Tim Lambesis, guitarist Nick Hipa, bassist/vocalist Josh Gilbert, and drummer Jordan Mancino, As I Lay Dying has been racking up the body count in mosh pits around the world since their California establishment in 2000. Awakened continues the metalcore and thrash, building on the Decas retrospective with a few more steps along the bloodied trail. As is usually the case with these blokes, the drive and volume of their routine usually makes up for the inborn lack of ingenuity. From the snaking, chaotic guitars of lead single “Cauterize” to the laboured, by-rote plod of “No Lungs to Breathe,” Awakened’s haphazard approach fulfills the aggressive needs of listeners but leaves little room for much else. The shifting tempos and blending harmonies of “Wasted Words” is the best track on the album, with Sgrosso and Hipa twisting each other into knots. As I Lay Dying’s retro tendencies are also on display, like with the robust but cluttered “Defender.” The cut starts off strong with Gilbert passing the vocal torch to Lambesis, but the goodwill built through a set of classic solos is undone by a noisy, baying chorus. More old school vibes flood album closer “Tear Out My Eyes,” making hay out of its “whoa-oh-oh” vocal fusion. 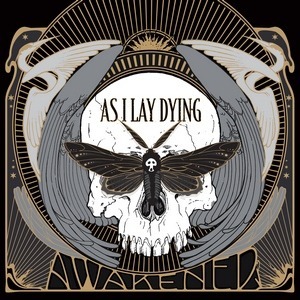 With Awakened, As I Lay Dying has created a hammering, hostile amalgam of metalcore and thrash. The retro components are welcome, but the lack of imagination and progression may ultimately keep this talented band from moving to the next level. That may or not be a problem, however, as hordes of tattooed zealots have been happily filling pits for over a decade with no signs of slowing.